Roya is available for accordion tuition, background music, duo, trio and ceilidh band for weddings, ceilidhs, pubs and parties, etc. A box player from Muir of Ord, Roya started playing Classical and Scottish Dance Music on the accordion and piano at age seven. Her interest in music came from her grandfather, button box player Fraser MacLean whose band she used to play accordion and piano in from the age of twelve. Roya graduated with an Honours Degree in Gaelic and Traditional Music at Sabhal Mor Ostaig and is now a self-employed musician and accordion teacher. 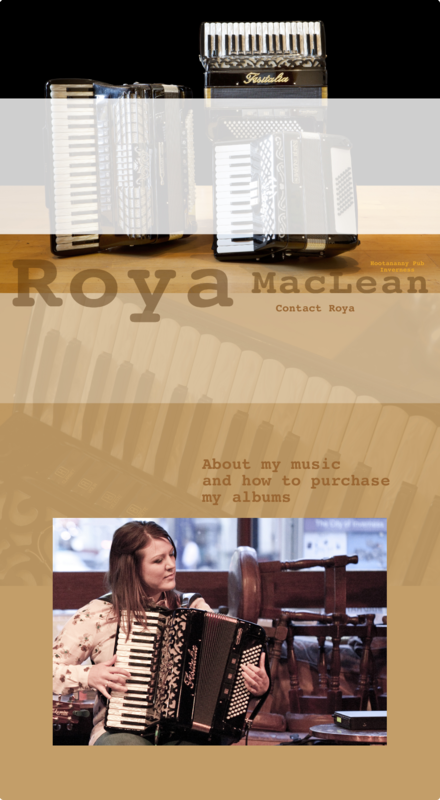 Roya is influenced by various forms of Celtic music, in particular the Accordion, Fiddle, Pipes and Gaelic Song. Roya worked on P&O Cruise Liners Aurora, and Arcadia travelling around the Baltics and the Mediterranean, which she found to be a great experience.